The brilliance of Mali's maestro of the ngoni, a traditional wooden lute, Bassekou Kouyate shines through in this album Ba Power with its magical blend of ancient griot traditions and modern music making. Siran Fen is an electrifying rock production of interlocking ngonis coupled with the burning vocals of Amy Sacko, as her husband, Bassekou, wrings out blinding solos. Music in Exile, this year's debut album from another Malian group, Songhoy Blues, also proved how musicians could not be silenced by the recent Islamist occupation of northern Mali. Exiled Ivorian reggae star Tiken Jah Fakoly recorded this delightful album of classic reggae covers featuring an impressive array of reggae legends in Jamaica. On Is It Because I'm Black, he shares the mic with soulful crooner Ken Boothe as sounds from the kora, the West African harp, and ngoni compete before the powerhouse rhythm section of Jamaican duo Sly and Robbie kicks in. Irie! Morocco's premier rap star Don Bigg teams up with singing pioneer of urban Moroccan music, Ahmed Soultan, to produce the album Talet. The track TJR is a sparkling piano-driven production rapped in Darija (Moroccan Arabic) and sung in the Berber language Amazigh to tell the poignant story of a beloved grandmother who will never know her grandson. The rulebook of Congolese music is being torn up and reinvented. Mbongwana Star, on my list of bands to watch out for in 2015, made a big international impression, blazing new frontiers with their post-21st Century genre-defying album From Kinshasa. The irresistible track Nganshe represents this new sound: It crafts a terrain of fractured rhythms and distressed sounds that meld into frantic futuristic dance mayhem. 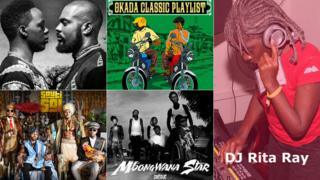 It's still boom time for Nigerian creativity, boasting a growing music industry that is the dominating sound in Africa. The Okada Afrobeat Playlist Volume 1 compilation is a gateway into Naija street sounds from way back when to right now, from Sir Victor Uwaifo to P-Square and Afrikan Boy. Featured too is the new siren of Afrobeats May7ven, with the dance track Werk. Proving that age is no barrier, the veterans were out in force this year and more than held their own. Among them the reformed pioneers of West Africa's Manding pop, Les Ambassadeurs with Salif Keita, produced the magnificent EP Rebirth. An expert in the Kenyan nyatiti - or lyre - Ayub Ogada released the enchanting Khodi. Triumphantly resurrecting Ghanaian highlife is Pat Thomas and Kwashibu Area Band. The self-titled album is laced with guitar riffs and the majestic horn arrangements of Ebo Taylor that tug on the nostalgic strings of the heart. The track Odoo Be Ba features the dancing drums of Afrobeat legend Tony Allen, who released the very fine album Film of Life in 2015. When it comes to dance floor innovation on the continent, Angola is leading the way. Djeff Afrozila with Yuri Da Cunha and BzB are cooking up a storm with the clubland sensation Ser Kazukuta. But moving up on the inside track are their compatriots Tchobari. The innovative duo - Sarissari and Tchoboly - create a new sound by mashing up Angolan dance sound kizomba with semba guitars and Afro house as on the track Nzaya, which also features Daniel Nascimento and Viviane Chantel. The most original live performance of 2015 goes to Cameroonian magician Blick Bassy at the Africa Utopia Festival in London. Just three people on stage - Blick, mainly on banjo, and two others on cello and trombone - created stark yet inviting melodic genre-shifting soundscapes that evoked musical influences spanning Africa, Brazil and the US. On the haunting Delta blues-inspired track Ake, Bassy plays harmonica and wistfully sings in his mother tongue Bassa. In this YouTube age, videos are the order of the day and there was a profusion of witty, arty and even epic films. Meklit's Kemekem, meaning I Like Your Afro, is a contemporary take on a traditional Ethiopian song. This classy track is further enhanced by the video - an engaging choreographed office romance, flirtatiously celebrating the Afro hairstyle. In Bongo Flava land, Tanzania's singer Alikiba stormed back into the fray with Cheketua Cheketua but it was rival Diamond Platnumz who swept up the awards. Kenya's Sauti Sol made headlines around the world when they got US President Barack Obama dancing during the trip to his father's homeland in July. The multi-award winners end the year with the title track from their hit album, the defiant, uplifting, Live and Die in Afrika.